Hey Stay Close to Home Readers! My name is Teresa and I blog over at Crafting in My Closet. I’m a stay at home mom to two wonderful girls, my husband is a student, so we are on a tight budget. I like to craft and sew, but have little to no budget for it so I have to make do with what I can and like to share with others how to as well. I’m so excited to be guest posting here on Stay Close to Home today! Thanks for having me. Its the beginning of June, which means only a few more weeks till Fathers Day. Its one of those holidays that kind of sneaks up on you. Every year I try to think of something new, and every year I end up doing the same thing. I make my husband chocolate covered strawberries and other goodies and then arrange them in a pot I decorated a few years ago. He loves that pot. It sits on his desk and gets filled 3 times a year. Valentines day, Fathers Day and his birthday. He counts down to that pot being filled. Its actually pretty adorable. You can see my step by step instructions here. So this year instead of trying to come up with something new and different, I decided I would still get him his chocolate covered yummies, since he looks forward to them every year but I wanted something else too. I also want to help our three year old do something for her daddy. I found this awesome website that puts pictures on water bottles called wawabots, and ordered one for my husband from the girls. It has some cute pictures of them with him and says “worlds best daddy”. I got him the Simple design and it cost $24.95, although I got a living social deal to get it for $12, but $24.95 is still a pretty good deal as I’ve seen similar products for twice that. So the WaWabot is cool, but I really wanted my 3 year old to make something, 1) because she loves to make stuff for us and I want her to feel included, and 2) I don’t want to spend the next 16 years buying presents for her daddy when she can make him something. I know we’ve all seen the obligatory macaroni art and other childhood craft projects that are done in schools all over the country. But I wanted something different, something that we wouldn’t mind having hanging in our house longer than a week. I’ve been trying to come up with something Tabitha could do and it would really be hers. So I laid out a piece of butcher paper and let her go to town with her markers. She had a blast. Then I used the paper she colored to cut out leaf shapes that I then attached to a canvas that I had painted with glitter modge podge to create this. I got the canvas at a local arts and crafts store that sells 2 packs for about $8, Painted the top blue and did grass on the bottom. Then I did footprints of each of the girls in brownish gold and Tabitha’s handprint, I tried to get Evangeline’s, but at 4 months she is a strong one and woulden’t open her fist for anything. Then I attached Tabitha’s leaves I cut out form her coloring to the fingers. Next to the trees I put this quote. The greatest gift I ever had Came from God; I call him Dad! ~Author Unknown. Total this gift cost me less than $5 since I had the paint and brushes on hand. This was a simple and fun craft to do with the girls and I know their dad will love it and it was a wonderful memory to create with Tabitha. I hope you all like it too! How adorable! 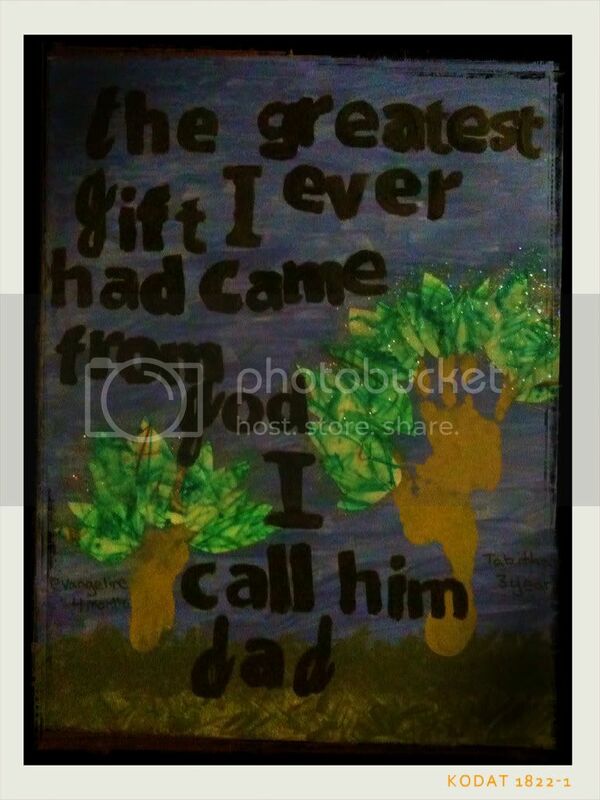 Such a cute, thoughtful and personal gift to dad! Wow– that’s one of the sweetest gifts I’ve ever seen. Homemade gifts (from kids) are always sweet, but when it can last, like this? Wonderful. Great post, made me tear up!